This post is part of the Me-TVs Summer of Classic TV Blogathon hosted by the Classic TV Blog Association. I could be having such fun with Me-TV because they are running My-Show, My Three Sons. The program ran from 1960 - 1972, that's 12 seasons of situation comedy shenanigans originally on ABC and then from 1966 on CBS. We are invited into the life of the Douglas clan of Bryant Park, Somewhere, USA. 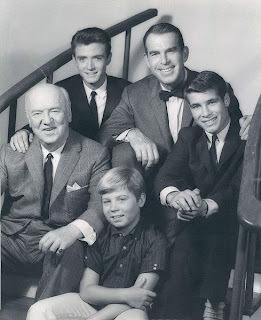 Widowed aerospace engineer Steve (Fred MacMurray) is raising his three sons Mike (Tim Considine), Robbie (Don Grady) and "Chip" (Stanley Livingston) with the help of his father-in-law "Bub" O'Casey (William Frawley). Film star MacMurray moved into the world of television with a unique contract which allowed for the shooting of all of his scenes in a block. Over the years much has been written that this arrangement may have been difficult for others on the set, but I've always thought it was cool that someone could get bosses to see things his way. The strange way of getting the product in the can certainly didn't impact the viewer's response to the quirky show. I think it may have led to a sense of freedom and certainly a very nice energy among the young performers. The Douglas' lifestyle is very relatable. The house (set) looks lived in with newspapers on the floor, dishes drying in the dish rack and nothing ever in its assigned spot. The boys, especially Chip, sleep in mismatched shirts and pyjama pants and the dog, Tramp, is everywhere. Teenagers do not wake up when first summoned and they never want to do their allotted chores. There's bickering and yelling, and nobody listens. It's a real home. Time would bring many changes to My Three Sons. Eventually Tim Considine left the program as Mike married and moved away. Another third son was welcomed to the fold in the form of orphaned Ernie Thompson (Barry Livingston). The kid cracks me up! William Frawley was let go because of possible health/age/insurance issues and was replaced by William Demarest as cantankerous Uncle Charley. The original black and white show was now in colour. The Douglas family moved to Los Angeles where Robbie married Katie (Tina Cole) and they were saddled with triplets. Steve married Barbara (Beverly Garland). Not much was asked of Beverly as a sitcom wife, but she gave more than was called for with her vibrant personality. Barbara came with a daughter Dodie (Dawn Lynn), a game little actress surrounded by adults who did not know how to write for a little girl. Chip (little Chip!) married Polly Williams (Ronne Troup). It was fun to watch her parents played by Doris Singleton and Norm Alden. When I first married the housing market was tight in Toronto and my husband and I moved into the basement apartment in his family home. I was not altogether thrilled with the arrangement and as I unpacked I muttered under my breath that "When Mike married Sally he left the show". From another room, my husband with his Vulcan hearing countered with "Yeah? Well, Robbie and Katie movied in!" I don't know which era of programs Me-TV is treating fans to presently, but I raise a toast to them and to My Three Sons whether it is Robbie as a klutz, an escaped lion roaming the Douglas house or Chip and Polly freezing their salad. While we're toasting, let's include three of my favourite episodes from Season 1. A Monday morning with the Douglas family. The alarm goes off at 8:00 am and nobody wants to get up. A sleepy Steve stumbles to his draft board and places the drawing he has been working on all weekend in a tube to take to the office. The important work lands instead in the garbage can by the desk. Robbie sounds a drowsy Reveille on his trumpet, drops it to the floor and goes back to sleep. Chip and Tramp amble to the living room and turn on the TV watching the launching of a satellite. Mike does some half-hearted callisthenics and works on memorizing Chaucer for class. Bub starts yelling for the laundry, and for the trash for the incinerator. Chip has nothing for "Show and Tell". Robbie hasn't written his English assignment because nothing dramatic has ever happened to him. From the television, we hear Paul Frees as the announcer describe the intricate machinations which go into the launching of a satellite and how every person involved is integral and has a role to play in the success of the operation in the important period leading up to the countdown. This narration is mirrored by the actions of the Douglasses coping with four fellows and one bathroom, homework assignments, household chores, lost items and a myriad of little details leading up to their own countdown. Disasters are averted as we reach zero hour and as the satellite falls from the air in a spectacular failure we learn that the broadcast is originally from 1957 and the car radio alerts our intrepid crew that their clocks were wrong due to daylight saving time. Steve finds a spot on the couch, Mike and Bub are on chairs, Chip is on Tramp and all are sleeping except for Robbie who finally has something dramatic to write about for class. 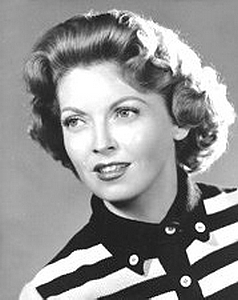 Dorothy Green (Face of a Fugitive, The Big Heat, The Young and the Restless) guest stars as Dr. J.M. Johnson, a freelance engineer hired to assist Steve on a project. The attractive woman is devoted to her career, but Steve is smitten. When they first meet Steve doesn't realize she is to be his new working partner and follows her through the maze of office cubicles with a lost glove to some spiffy jazzy flute music. He assumes she is one of the guests on "Visitor Day" and attempts to make conversation by explaining the work and equipment. He feels very foolish when put on the spot by Dr. Johnson, but the infatuation continues. Steve hopes a working dinner may lead to romance and he tries to arrange the perfect atmosphere at the restaurant with low lighting and flowers and practising his moves. Again, Steve is made to feel foolish when he sees Dr. Johnson has arrived early and has been observing him from another booth. Fred MacMurray is so much fun to watch in his anticipation and discomfiture. I think one of the things that made him such a good, solid actor in all of his roles is that MacMurray started as a musician. He plays those notes on the page as called for, but he's not afraid to add those grace notes. Things gradually do start to move toward a more personal relationship between Steve and Joan, but she stops short from meeting his family, afraid to get caught. They miss their last chance to be together because of a missed phone message and after we get to see Steve in a situation away from home and family, it is back to broken appliances and taking care of the boys. Mike and Robbie have a lot of things in common, they are both broke, they are both looking for an odd job and they are getting on each other's last nerve. Steve wonders why the boys have never thought of just doing something for somebody just for the sake of doing it. When the milkman Harry (Robert Gothie) mentions that the Jensons need their fence painted, Robbie gets the job from Mr. Jenson and Mike arranges the same thing by telephone with Mrs. Jenson. Mr. and Mrs. J are away from home when Mike and Robbie start haggling about the job while Chip and his pal "Sudsy" (Ricky Allen) goof around. Mrs. Foster (Ann Morgan Guilbert) is watching the boys and gets involved in an advisory capacity with Mike and Robbie's paint job. Mr. Kincaid (Malcolm Atterbury) starts contributing his two cents and so does Bub when he comes along on his second trip of that day to the grocery store. More neighbours, Verna (Pearl Shear) and Pete (Bill Idelson) fill out the crowd. Everyone is talking about everything under the sun from Bub's navy days to ecology to silent films to sports to housework. While they talk, and not really listen, everyone starts pitching in on the Jenson's yard. Chip and Sudsy start selling their lemonade and sandwiches, eventually branching out to fruit and veggies when a seller passes the street. The day rolls on and the Jenson's yard is neat and tidy, Chip and Sudsy are successful entrepreneurs and Mike, with Robbie's agreement, writes "No Charge" on their bill to Mr. Jenson. Back at home, Steve is at first upset at the thought of the boys making money of an elderly couple on a pension, but Mr. Jenson's phone call of thanks makes Steve proud of his sons, and he's more than happy to spot them an extra couple of bucks for Saturday night. The theme of people pulling together, the cohesive work of the acting ensemble, the clever non sequitur lines and editing make Unite and Sink an all-time great in sitcom history. Here's to a better second attempt on my part. This is a great post. I love that you highlighted season 1 since many of us primarily grew up seeing the Rob, Chip, Ernie trio. Syndication was wacky for this show, wasn't it? All those colour episodes were imprinted on our brains and the early seasons became the stuff of legend. In the past few years, I've seen the B&W episodes, but have missed out on the later years. LOVE My Three Sons. I haven't seen it in years, but holy cow you brought back memories. I can't believe Chip got married?!? What I remember most about the show is MacMurray's indefatigable charm. What a wonderful actor. I'm glad I sent you back in time, Amanda, to an obviously happy place. I remember MacMurray thanking us on behalf of the folks at Battle Creek with a "Welcome to our show". Though I watched My Three Sons often as a kid, I learned a lot from your post. I had no idea the series ran that long, for one thing. I also did not realize that Ernie and William Demarest were not with the show from the start. For me, they were the show! Terrific post. CW, I think you seized on the key reason for the long-term success of MY THREE SONS: The family evolved as the years went by. So many sitcoms seem to box themselves into a corner (Mork and Mindy eventually marry...but what then?). MY THREE SONS just added and replaced cast members and chugged merrily along. The "Lady Engineer" episode is a wonderful choice because it highlights Fred MacMurray's comedic skills--I wouldn't call him a comedian, but an actor with a superb comic touch. Another fine post! Your usual fabulousness shines through - again. I loved this show as a kid, though I can't say I remember many details of episodes, but rather pockets of memories, much as it is with reality and family and friends now gone. You pay the show great tribute. A wonderful choice. I also had a huge crush on Robbie. I liked this show and watched it in the last few years of its run, but haven't seen an episode in decades. Thanks for an informative post which brought back memories and taught me many things I didn't know or remember. Great post! I watched the color episodes as a child and really loved them. I wish I had access to Me-TV. Troy, few folks cracked me up like watching Ernie and Uncle Charley. Thanks. Thanks, Rick. MacMurray had the knack of being able to do whatever was asked of his character and do it so well that his ability is sometimes overlooked. Revisiting some of these episodes is a chance for a new appreciation. You make me blush, Aurora. I love your phrase about the pocketful of memories, just like real family. Boy, it sure was easy to have a crush on Robbie, wasn't it? Here's an episode from Season 2 that you might enjoy. Robert Wilke guests as a professional golfer. Dawn, I'll wager there's more than a few of us whose introduction to Fred MacMurray was as Steve Douglas. It's fun to gauge the reaction of some when they see "Double Indemnity"! Ha. Amy Lynn, I hope some day you get to see the earlier episodes. I think each era of the program has its own charm. "The Douglas' lifestyle is very relatable. The house (set) looks lived in with newspapers on the floor, dishes drying in the dish rack and nothing ever in its assigned spot. The boys, especially Chip, sleep in mismatched shirts and pajama pants and the dog, Tramp, is everywhere. Teenagers do not wake up when first summoned and they never want to do their allotted chores. There's bickering and yelling, and nobody listens. It's a real home." This paragraph is so perfect and the Douglas family was so real unlike the kids from most TV shows back then, except maybe for Eddie Haskell from "Leave it to Beaver." The show was a staple in our home and like someone else mentioned this show was my introduction to Fred MacMurray until I saw a darker side to him in DOUBLE INDEMNITY. Excellent!!! To answer your question--Me-TV is only airing the color episodes. But those are the ones I grew up watching and still love to watch. I recently read Barry Livingston's memoir just released last year. It's fantastic! And you'll be amazed to find out how much acting he still does! He's even been on Mad Men!? But few recognize Ernie Douglas anymore. John, it's those little details that made Douglas home and "My Three Sons" stand out from the TV crowd. It's a place we always enjoy visiting. Joanna, I read "The Importance of Being Ernie" as well. Barry told his story frankly and with a lot of humour. Maybe we'll drum up a few more sales for him. Thanks for answering my question. It's been a long time since I've enjoyed those episodes. Of course, if we were lucky enough to receive Me-TV around here (southern Ontario), I'd never do anything but sit in front of the set. Thanks for the link to the golf caddy episode, Patricia! I'd never seen that one before, but it reminded me of the special qualities of this series. My pleasure, Jeff. I'm glad you were able to fit it into your busy day. Since I first saw that episode I've never been able to look at Robert Wilke shooting it out in a western without thinking he'd rather be golfing. How fun. I, er, wasn't around when the show started, but I do remember seeing it in the late 1960s through the end of its run, and was a favorite of mine growing up. I haven't seen it in years but it was enjoyable reliving the series through this post. I'll have to watch a few episodes, especially the B&W ones I didn't see growing up. I wish Me-TV would run the black-and-white episodes (1960-65) in rotation. Unless you remember seeing them on Nick at Nite long ago, they're scarce as hen's teeth and that's a shame because some of those episodes (you mentioned "Countdown," which is a classic) are really first-rate. Just a tiny nitpick: Bill Frawley left the show not due to illness, but because the producers couldn't get anyone to underwrite an insurance policy for him due to his age. There's a certain irony in the fact that the company where the show was filmed--Desilu--produced Frawley's TV legacy, I Love Lucy. ClassicFilmBoy, my history with the show is along your lines. It wasn't until the 90s that I caught up with the earlier episodes on a local Toronto television channel. I was blown away! Thanks, Ivan. I thought illness was the barrier to the insurance, it's a shame if it was entirely age related. I shall amend. PS: I hadn't noticed your dashing photo before. Is it new? Cool piece. I guess I'm the only one who actually prefers the later episodes - but that may be my Tina Cole crush talking. I enjoy all of the seasons of "My Three Sons". They make me laugh and they make me smile. They just plain make me happy. I'm one of those who grew up on the earlier seasons of "My Three Sons" and am less familiar with the Uncle Charlie/Ernie years. I haven't seen the series for a long time, so reading your post brought back fond memories - including the recollection that, though Mike was the dreamboat, I had a crush on Robbie. Time seemed slower back then and the fact that the show ran for 12 years with close to 400 episodes means there is something for everyone to enjoy and recall fondly. What a treat it would be to have all of the seasons available on DVD, to go through it all again with earnest Mike, dreamy Robbie, lovable Bub and gruff Uncle Charlie. Here's hoping. This is a really well-written and lively post, Caftan Woman! Count me in as another 70s kid who saw mainly the Ernie color years (with Demarest) in syndication, but I still loved the show and always thought MacMurray was a pretty cool (if preoccupied) dad. I need to see some of those early seasons with Frawley - the three episodes from that era you describe sound great. Jeff, I appreciate the compliment. I'm sure once you get a chance to see the early programs in the series that you'll really appreciate them. The nice thing is, they don't detract from how much fun it is when Ernie arrives on the scene. I've never seen this show but it sounds a real treat. I've also never read anything about this series until I read your post, and I'm keen to check this series out. There's always something new for us to discover in the television history trove. I'm delighted to have been your introduction to "My Three Sons". As you can see from the previous comments, the show has a lot of fans and with good reason. Great post! 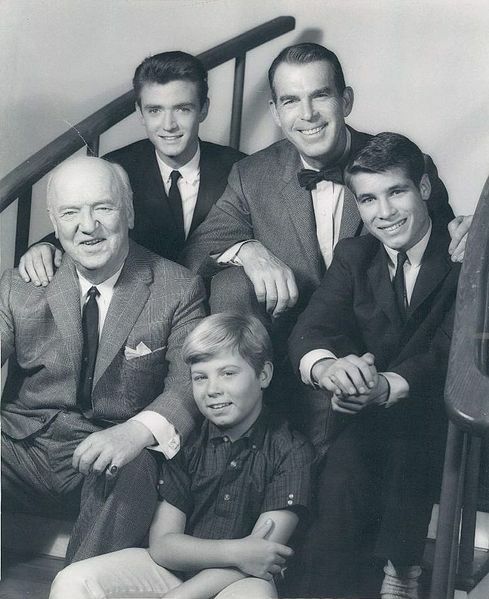 I enjoyed watched My Three Sons as a kid because if anything, I was absolutely fascinated by it. Here was a house filled with mean and boys- completely opposite from my childhood. Other than my uncle who is only 6 years older than me and more like a big brother to me, we were a large matriarchal family of women and girls. My father has 6 sisters and most my cousins are girls (the few boy cousins I have didn't show up until about high school) and my father wasn't around much. So, I thought this was utterly fascinating to see a family of males. Thanks for bringing back these TV memories in such great detail. It was a pleasure to write about "My Three Sons" and meet others to whom the show meant a great deal. What a nice escape from all those women for you!